Home » Reviews » Britax Frontier 85 Review: It’s All New, Is It For You? Britax Frontier 85 Review: It’s All New, Is It For You? There’s nothing like an updated product to save time writing a full review. Find the old review, update the details and presto, new review! The original Frontier was a pretty good combination booster. In fact, I’ve been using one daily for over a year and a half. We’ve even reviewed it twice, HERE and HERE. So why the new Frontier? 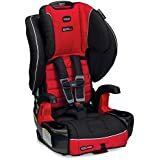 Basically, Britax took the old one, improved the maximum height and weight limits and then went on and addressed all the issues they heard about from customer feedback, like this thread on our forums. Plus, they did it in just over a year and a half. Very impressive! Until March 31st, you may enter to win a Britax Frontier 85, courtesy of our sponsor, Kids-N-Cribs.com! To enter, please visit our forums for more details by clicking here. Top harness setting up almost 2″, from 18.25″ to about 20″ seated height. The main shell of the Frontier 85 is about two inches taller than before. Width and depth are roughly the same overall, but there are minor variations in the contour. (No cover compatibility, sorry!). According to my scale, it weighs over 2 pounds less than before. The slots for routing the lap belt for harness mode installation are revised. The position is similar to the original Frontier, but the contours are more angled and open. Perhaps this may help resolve issues for those who had trouble with installations in certain vehicles, especially with the short belt path and LATCH. LATCH attachments appear to be the same, but now have prominent SafeGuard branding. Unfortunately, there is now a LATCH adjuster on only one side. The original Frontier had adjusters on both sides, perhaps making installation a bit easier in some cases. The strap to adjust the fit of the harness is narrower, along with a narrower adjuster mechanism from IMMI that is a “push type” instead of a “lift type”. There is also a small groove on the bottom of the base for the strap, presumably to reduce the chance that friction against the vehicle seat cushion could make it harder to pull. Crotch buckle slots have been revised slightly (5.5″, 7″ and 8.5″ according to Britax). They seem quite similar to the old one in actual use. The buckle also seems a hair easier to rethread and lock into place underneath the base than before. There are now 4 booster height settings, down from 6. Also, the actual maximum booster height is slightly lower than the original, despite the increased limits. I am told this is, in part, because the original Frontier actually adjusted much higher than the specifications indicated for booster mode. For booster use, you may purchase an optional “Secure Guard” clip accessory, similar (but not identical) to the one in the Britax Parkway SG booster. (Under $20 MSRP). The cover I received is the same Red Rock pattern as my original. It is quite similar but has minor variations. The “mesh” material is back, and I know some of us owners had issues from snags and wear. On the plus side, the mesh material does not extend nearly as far down the thigh so this should help from a durability standpoint based on my experience. The bottom of the shell has a few less rough edges due to the redesign of the cupholders and may be a bit friendlier to leather vehicle seats than before. There are small rubber grips that may help reduce sliding. The recline block now “snaps” securely into place in both positions. The back of the shell has a small threaded hole to store the screw you remove when converting to booster use. Honestly, this is a very nice list of improvements. Almost every important facet of the weight and height limits was increased. Almost every minor quibble with the original design was updated and appears to be improved. Overall, this really is a prime example of a company listening to consumers and making a good product even better! Please keep in mind I’ve had it less than two weeks, so my opinions may change with more experience! And now on to the boring re-hash of the original review. I apologize that it’s a novel. I try not to write reviews this long any more, but this one was mostly recycled from the original! Side Impact Protection– Most child restraints are quite effective in frontal crashes when used properly. Side impacts are gaining attention because they can be very dangerous, even to properly restrained passengers. The relatively deep wings for the torso and head provide added protection from intrusion. In addition, the wings around the head are padded with energy absorbing foam. The Frontier 85 seems to be the same as the original Frontier in this regard. 5-point Harness to 85 pounds– Among the best features of the Frontier 85 is the 5-point harness that is rated to 85 pounds, a 5 pound increase from the standard Frontier. While most kids above 40 pounds can use a booster, some may not be mature enough to remain seated properly in a lap and shoulder belt. In other cases, parents may prefer to keep their child in a 5-point harness beyond 40 pounds because it may offer somewhat more protection in side impacts and rollovers than a 3-point lap and shoulder belt. Britax recommends use of the harness system to its limits before using the Frontier 85 as a booster. The harness material is slightly different and appears more similar in feel to that found on some of the Britax convertibles. This may help keep it from folding over in the buckle as would happen in the original Frontier from time to time. Added stitching keeps the sliding buckle tongues from getting lost in the corners. My daughter (above right) is 9.5 years old, 4’6″ tall and weighs 76 pounds. You can see she is very close to the seated shoulder height limit of the Frontier 85 in harness mode. Multiple Harness Height Settings– The harness adjuster has ten height settings to fit children of varying sizes. The slot at the level of the child’s shoulder or slightly above is the correct one to use. The top slot is about 20″ above the seating level, just a hair under 2″ taller than the top setting on the original Frontier. A child will outgrow this seat by height if their shoulders are above the level of the top slots, or if the top of the child’s ears are above the top of the headrest. The height adjustment is accomplished by a handle on the back of the seat. Though no rethreading of straps is necessary in most cases, the Frontier does need to be removed from the vehicle to adjust the harness height. The new height adjuster is significantly revised. Compared to the original, it uses high density plastic and has a large steel reinforcement bar, too. I find it works well, but mine is not quite as easy to adjust as the original Frontier, especially into and out of the top setting. This could just need some break-in, I’m not sure. Anyway, it is a small price to pay for what appears to be a much more robust adjuster. Harness Adjuster and Use– The Frontier 85 has a one-hand-pull front adjustment to tighten the harness. It is made by IMMI and is narrower than the one on the original Frontier. The strap to tighten the harness comes through a slot in the front of the seat and is also narrower than before. The release button is hidden under the pad on the top of the seat. This allows for easy adjustments to make the harness tighter or looser. On the Frontier 85 you push in the lever to adjust, whereas on the original Frontier you lifted up on the lever to adjust. It feels about the same as the original in limited use. The harness buckle clicks when each buckle tongue is inserted. Various Britax convertibles have a Velcro fastener to hold the harness out of the way while the child is placed in the seat. On the Frontier, the armrests are convenient place to loop the harness system out of the way when not in use. LATCH– The Frontier 85 includes a single flexible strap with connectors on each end to attach to the lower anchors found in newer vehicles. Now, only one side also has an adjuster and push-button release mechanism. A minor drawback. Convenient slots on the side of the seat are provided to store the LATCH attachments when not in use. Unlike some other combination models, Britax allows you to use the lower anchors and the top tether when this model is used as a belt positioning booster. This can help keep the booster in place while loading, unloading, during turns or when the booster is not occupied. An energy absorbing Versa-Tether top tether strap is also included and use is recommended at all times. Most vehicles on the road today have top tether anchors or can have them fitted at a dealership. The top tether strap MUST be used when the harness is used for children 65-85 pounds or anytime the lower LATCH attachments are used. When not in use or when used in booster mode, a storage clip at the bottom of the recline block keeps it securely fastened. Base and Crotch Strap Adjustment– The crotch strap has three adjustments, with the slot positions slightly changed from the original model. Changing it requires the seat to be removed from the vehicle. A metal clip is threaded through the base and reinserted into another slot. Most older kids will be using the outermost slot. The inner two slots may be more appropriate for kids closer to the minimum age and weight limits. Select the slot closest to, but not under the child. The Frontier 85 is also reasonably deep and should accommodate older kids fairly well. A belt shield cover attaches to the bottom of the back of the Frontier 85 to keep the harness strap system from getting stuck against the vehicle seat back. It works well, but it can be a bit finicky to attach if you’ve removed it to remove or install the harness. Padding and Comfort– The Frontier 85 is very well padded all around and seems very comfortable. My cover is “Red Rock” solid black, grey and red, similar to the original Red Rock Frontier. The breathable, red mesh fabric is down the middle. The very soft black and grey fabrics are like a micro-fiber velour and are on the wings, thighs and edges. While the Frontier 85 will launch only with updated versions of the same fashions, hopefully we will see some additional styles in the future! The harness system is black with grey “HUGS” and black comfort pads to keep the harness straps from irritating the child’s neck. The chest clip should be positioned at the level of the child’s armpits. Sturdier, fixed armrests replace the adjustable ones in the original Frontier. A large comfort pad is also attached to the crotch strap to keep the buckle and strap off the child. This is handy if the buckle is hot from being in the sun. Belt Guides– When converted to booster mode, a red shoulder belt guide positions the shoulder belt right under the head restraint. This guide is open and should allow free movement of the shoulder belt in most vehicles. In vehicles with low shoulder belts that come from the vehicle seat, you may find in a few cases that the belt has to come up over the back of the Frontier shell, then down the front to the guide on a shorter child. This might add some friction and so you need to make sure any slack it always taken up by the retractor. A red lap belt guide indicates the routing of the lap belt, under the armrests. The original Frontier was an IIHS “Best Pick” for positioning the seatbelt in booster mode. The geometry of the lap and shoulder belt guides is quite similar to the original. So, I expect the Frontier 85 to perform similarly, as it did in my observations. 9 Year Expiration– Other models that may claim to be the only seat your child will ever need may actually have 6 year expiration dates! Starting at 2 years, this could indeed be the last seat your kids will ever need. However, if the seat is involved in a moderate or severe crash, it may be unusable. Please contact Britax for guidance on crash replacement. Cupholders– The Frontier 85 now has fixed cupholders on each side of the front of the base. One quibble with the original Frontier was that the cupholders could be difficult to open in some vehicle seats. This will no longer be an issue. They are also reasonably deep. The only possible drawback may be with the biggest kids who would not be able to spread their legs to the side with bottles in both cupholder. Given how many cupholders are in vehicles these days, I’m not seeing this as a real issue for most kids. Crash Indicator– The top tether strap has a special stitching indicator that will break free if subjected to forces in a moderate or severe crash. The manual shows how to inspect the seat to determine if the Frontier is no longer acceptable for use. It is still possible that the Frontier could be involved in a moderate or severe crash and not break the stitching, for example, if the top tether wasn’t attached or tightened correctly. That is only one example, there are other possible crashes that may not cause the stitching to rip, so caregivers should refer to the NHTSA guidelines on re-use of crashed child restraints or contact Britax for guidance on using the Frontier after a crash. Value– With a 9-year expiration date, you won’t need to buy additional seats for your kids down the road! It’s feature packed and well built, so you will get your money’s worth. Construction– The Frontier 85 feels solidly made. The main potential issues for durability on the original Frontier seemed to be the bottom of the mesh cover, the cup holders and the armrests, all of which have been revised and improved. Also, it IS made in the USA (Charlotte, NC) and not in the Far East, though some components, like the cover (made in Thailand), may be imported. Kudos to Britax for this! The Frontier 85 is a very nice combination seat for kids above 2 years old who are no longer rear-facing. It’s also ideal for parents who are moving one child out of a convertible seat so they can re-use the convertible for a younger sibling. In harness mode, it can be installed with LATCH, a lap belt or a lap/shoulder belt. Using seatbelts, there are two options: a typical “short” belt path and a “reverse” belt path. Like the Britax Regent, there are no built-in lockoffs on this model. LATCH installation in our 2006 Odyssey and 2010 Prius was typical. Parents will find it beneficial to pull the loop that tightens the LATCH straps through the belt path slot and cover, into the front of the seat before pulling to tighten (this is now more clearly reflected in the manual). The adjuster on the LATCH attachment strap may actually come up to the belt path slot in the plastic shell of the Frontier when the installation is secured tightly. This is less of an issue with the Frontier 85 as the belt path slots are a little more open. If you attempt to pull the straps from the side of the seat as is typical on narrower carseats, you may find that you cannot get a good angle to tighten the LATCH attachments adequately. Overall, the new design of the LATCH/seatbelt routing path should make LATCH installations easier for many vehicles. In most cases, this should also more than compensate for the fact that there is now only an adjuster on one side. You can see the new seatbelt/LATCH routing path and lower anchor use in booster mode in the photo (above left). For seatbelt installations, the manual now gives additional guidance on whether a short or long belt path might be tried first. This is based on the where the seatbelt system is positioned in relation to the width of the Frontier 85.
. On the plus side, the result is usually a very solid fit in the second row of our 2006 Odyssey and in the outboard spot of our 2010 Prius. The seatbelt now sits much better on the revised lap belt guide, as the gap between the guide and armrest has been redesigned. In some vehicle seating positions, the seatbelt may not be long enough for a reverse belt path installation. In our Prius, it was barely long enough to work. Please note that when installing with the reverse belt path, the shoulder belt is NOT routed through the red shoulder belt guide under the head restraint wings that is used in booster mode. The label on this guide applies to booster mode only. When using the long belt path installation for harness mode, the shoulder belt should lay flat against the fabric of the main shell of the Frontier 85 as shown in the photo above. Using the short belt path routing, it was somewhat more difficult than average in the second row our Honda minivan, about the same as with the original Frontier. This is due to the pillar mounted lap and shoulder belts that tend to allow for more side-to-side motion with the short belt path. I was still able to get an acceptable installation, but the long belt path is preferable in this spot. On the other hand, it installed quite well with the short belt path in our 2010 Prius and almost as well in the third row of our Odyssey that has a different seatbelt setup. With the short belt path, it’s generally easier to install unless you have a seatbelt system like in the second row of our minivan. The new, more open design helps reduce the issue of longer seatbelt stalks being a problem with the seatbelt routing path slots when using the short belt path. Another tip in some vehicles is to recline the vehicle seat back first, then install the child seat as tight as possible. When you have finished, bring the vehicle seat back upright to secure the Frontier a bit better. Finally, if the seatbelt stalk is so long that it protrudes through the slot in the Frontier 85, it may be possible in some cars to “twist” the buckle stalk to effectively make it shorter. One or two complete twists may do the trick, but no more than three full twists if absolutely necessary. Please keep in mind that an acceptable fit does not have to be rock solid! The seat is installed correctly when it cannot be moved back-to-front or side-to-side more than one inch, when given a modest tug at the seatbelt path. Conversion to a booster requires removing the harness system. This is outlined in the manual. A small screw is also removed from the back of the headrest, allowing a second adjustment of the head restraint for booster mode only. It is important to note that this second height adjustment cannot be used in harness mode. There is a handy screw holder on the back of the Frontier 85 so you can save it if you convert back to a harness system later. In booster mode, the seating position MUST have a lap and shoulder belt system. A lap-only belt system cannot be used safely with any booster. When using the Frontier 85 as a booster, the head restraint is adjusted so that the shoulder belt guide is above the child’s shoulders. The shoulder belt should then move freely and the lap belt should be routed over the red guides under the armrests. The Frontier 85 will accommodate many older kids as a booster, due to its very generous height and weight limits. The maximum booster height ends up being roughly a half inch shorter than the original Frontier. This seems odd because the specifications for the booster height limits increased on the new model. As it turns out, this is mostly because the published height and seated height limits for booster mode on the original Frontier were very conservative; it actually adjusted much higher than stated. My son is almost 11.5 years old, is over 4′ 11″ tall in bare feet and weighs 90 pounds. He doesn’t need a booster in most vehicles, including ours. Even so, you can see he still fits in the Frontier 85. This is the third of four height settings. At this height, the Frontier 85 wouldn’t even fit in our 2010 Prius because it was too tall and hit the ceiling! The owner’s manual is also new and improved. They’ve added tips and revised drawings. Each section has a checklist that corresponds to an illustration. They’ve also eliminated the short bungee cord and included a pocket at the side of the lumbar area on the back of the fabric cover to hold it. I had a little trouble finding it, but I’m told a tag will appear to help locate it. Most of these issues are not major disadvantages, but I list them here to alert parents about specific issues that pertain to the Frontier 85. Weight and Bulk– The Frontier 85 is big, about the same as before. It’s also somewhat heavy, but not as heavy as the original. It is still among the larger and heavier models, but this is because it must accommodate older and bigger kids. It now weighs under 20 pounds. The base measures about just over 19″ deep and 19″ wide at the cupholders. The width may be an issue for fitting three child seats across one row of seating, so you would have to choose the other restraints carefully. Like most harnessed seats for bigger kids, it’s not an easy model to be lugging through an airport. The Frontier cannot be carried by the harness system. Hold it by the shell and/or the tether strap for carrying. Installation in some vehicles– If your vehicle’s seatbelts are too short for the “Long Belt Path”, you will be limited to the “Short Belt Path” installation. On the plus side, the revised short belt path may work better for some installs in various vehicles. Like any child restraint, there is always a possibility that it will be incompatible with a few vehicles. As with all child seats, various types of vehicle seats and seatbelts systems may not be used at all. These are clearly indicated in the manual. Fabric Care– Removing the cover takes a little effort, as is the case on most harnessed seats. It is hand wash and line dry only. Best to avoid spills that might stain the seat! The mesh fabric has been known to snag, but it no longer extends down to the highest wear area under the thighs. My youngest son is 4.5 years old, almost 45 pounds and nearly 45″ tall. Here’s a short video clip of him using the harness. You can even view it in HD if you go to YouTube and select 720p! The major advantages far outweigh the few minor disadvantages I listed, in my opinion. Unless it is simply too big or too expensive for consideration, the Britax Frontier 85 is a superb choice if your “baby” is already a big girl or boy! Kids under 2 years old or under 25 pounds should really be kept rear-facing for safety. After that, the Frontier 85 really is the last seat your child will ever need and is almost unmatched for fitting big kids in either the harness or booster. Kudos to Britax for keeping the price the same as the original Frontier! You can order from many stores like our sponsor, Kids-N-Cribs.com and sale prices can usually be found at Amazon.com. Plus Amazon offers free shipping and free returns! (FYI – the similar 65 pound rated Frontier XT is also available in Canada). The Frontier 85 is somewhat expensive up front, but is very reasonable when you consider the benefits and lifetime. Like any type of product, you pay more for premium features and this seat is a class leader in many regards. With a 9-year expiration and improved weight and height limits, there’s a lot of value for the price, and it’s made in North America! “Harness Adjuster” What Company is IMMI? IMMI is a company that makes harness parts for carseat manufacturers, among other safety products: https://www.imminet.com/. They are highly respected. Hi I have a sister who is a quadriplegic she has cerebral palsy and I’ve been looking and searching for affordable seats (for comfort) for her for. we are driving in the car this summer we will be in the car for about 20 something hours and I want her comfortable she’s 4’8 and weighs 47 pounds. I have had two Britax Frontier 85 seats, and have had to throw them both out. The Harness Adjuster Strap frays to a point where I do not trust it. You cannot buy a replacement part. Poor design or poor material – regardless, unsafe. Britax has a good name, but they did not get this one right. I will not buy another Britax for fear they will be the same. Wow! Darren, so happy to have found this review! Our 7yo DS is t-a-l-l, we have an ’07 Ody, AND we just purchased the Frontier 85 SICT (after MUCH research, same as when we purchased the car in ’07). DS has been in 2nd row Capt. seat, placed in center position (stow & go seat removed). Where is safest seating position for the new CR so that 3rd row seat can be used for other passengers? I prefer he stay in ‘middle’ of vehicle (speaking both side to side & front to back) as our previous car was rear-ended 3x by cell phone users (handsfree too!). Since talk of LATCH not to be ‘trusted’ over 48 lbs., it sounds like we need seatbelt install. Tether definitely, but can we use BOTH LATCH & seatbelt? (i.e.LATCH to align seat and base anchor, seatbelt as additional final anchor.) I am assuming long belt path as you used in the ’06, but will check size/position of in ’07 against Britax manual prior to committing. @KECIA Thanks for the info. Actually, right now we’re avoiding the issue, because it’s winter and he’s always got a coat on. So the straps aren’t touching his neck. We’ll have to see how he feels when summer comes. So far, I’m still committed to the seat because I like how it functions and I love Britax quality.